Fortnite Battle Royale, in case you somehow haven't heard, is the single most popular game on the planet right now, and it's only getting bigger. In this Fortnite Battle Royale beginner's guide, we'll be walking you through a complete list of everything you need to know heading into the game mode for the very first time, as well as a list of essential Fortnite Battle Royale tips for players of all levels. Currently, we're well into the depths of Season 7 in Battle Royale. For everything you need to know about the ongoing seasonal event, including all the Battle Pass details, new skins and more, head over to our Fortnite Season 7 guide. 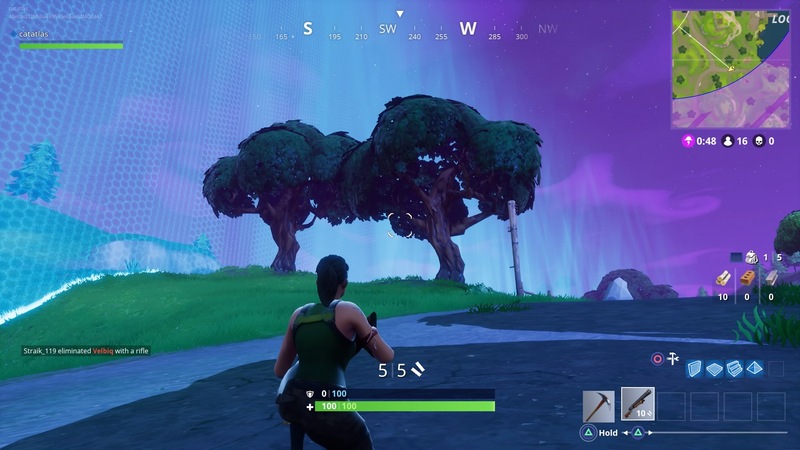 Just below, you can firstly see a complete overview of the Fortnite Battle Royale map. 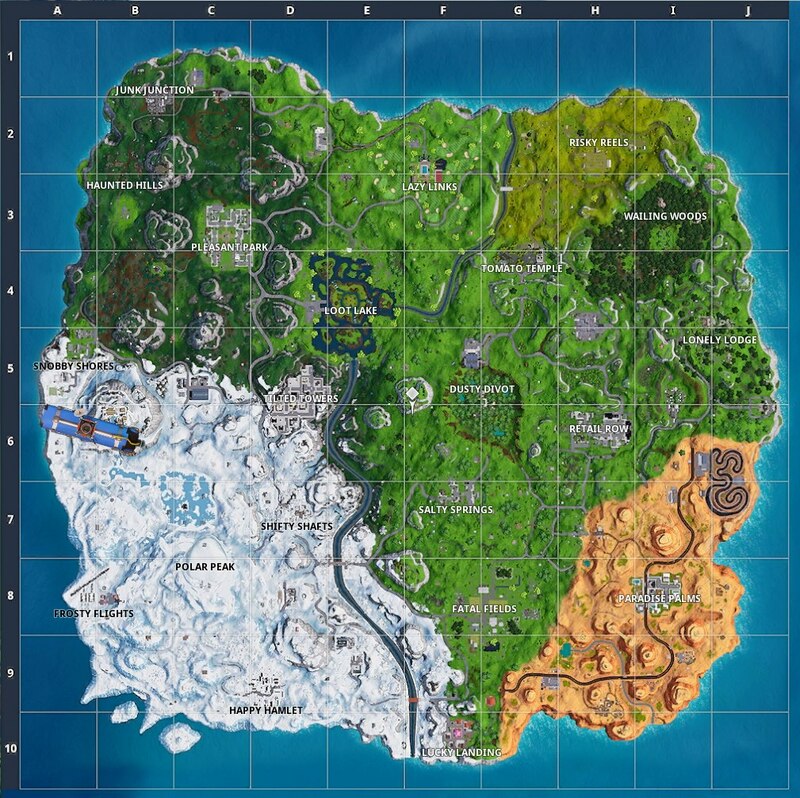 This map changes somewhat with every new seasonal event, but it's this map that the whole of Fortnite Battle Royale takes place on. When the Battle Royale game begins, you'll find yourself in a waiting area, right up until all 100 players have loaded into the game. In this area, nothing matters at all, so feel free to scavenge around and test out any weapons you come across. You'll definitely want to give automatic weapons a try if you can find them, as there can be some pretty severe weapon recoil to deal with, as well as a randomised bullet spread with automatic weapons. 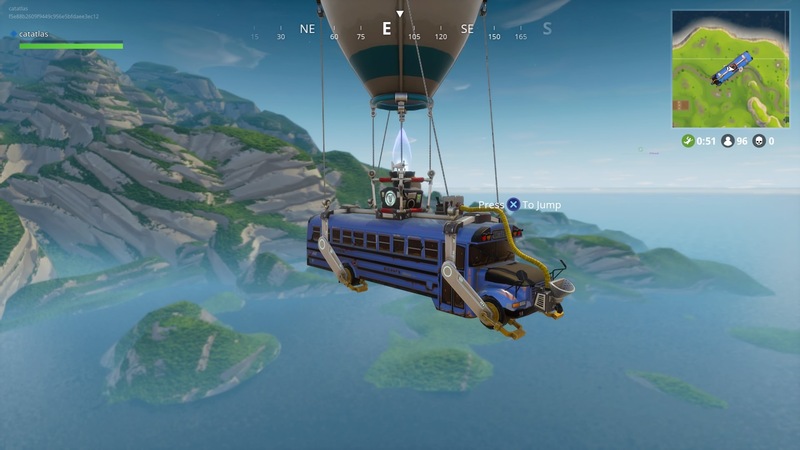 Once the Battle Royale game eventually begins, you'll be transported to the Battle Bus, and a timer will count down to when you can jump out. Bring up your map to tell which way the Battle Bus is headed, as the starting point of the bus itself will be randomised each game, so you'll have to always check manually on the map to see if the Bus is due to pass over any landmarks on the map. You'll need to choose when to jump out of the plane, and ideally aim to land nearby a building on the ground. 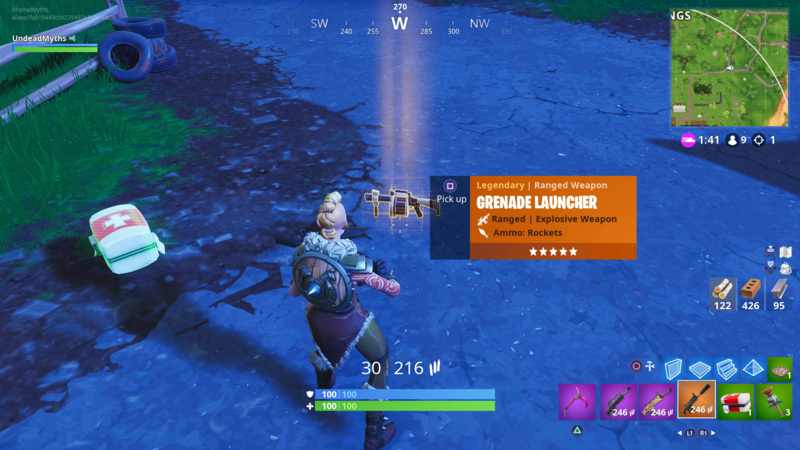 This is because the second that you eventually hit the ground, you'll want to immediately make it to your nearest building, as this is where you can find all the weapons and ammunition in Fortnite Battle Royale. You won't find any weapons or ammo just out in the wilds of the map, as it's instead all contained within houses and other buildings. Make sure any ammo you've picked up is loaded into your equipped weapons, and then scavenge your surroundings for any useful items you can pick up. Also, you might have noticed that you start out the game with nothing but a pickaxe. You can use this pickaxe to destroy any item in the environment, including walls, trees, furniture, and other objects. You'll gain wood, metal, and stone resources based on the items you destroy with your pickaxe, and we'd advise you try and get your hands on a good amount of these material types immediately, as you never know when you'll have to build items to escape an encounter. Otherwise, the only other mechanic you'll have to contend with in Fortnite Battle Royale is the Eye of the Storm. At the very beginning of the game, a minute timer counts down until a white circle is placed on the map. You always want to aim to be in this white circle, as anyone caught in the blue circle that closes in to the white circle will continually take damage. The white circle is called the Eye of the Storm, and as long as you're inside it, you'll be protected from the damage of the storm (the blue circle). You might be thinking that Fortnite Battle Royale sounds awfully similar to Playerunknown's Battlegrounds, and you honestly wouldn't be wrong in assuming this. But nevertheless, we'll give you some Fortnite Battle Royale tips and tricks, in order to make sure you're one of the last players standing no matter what situation you find yourself in. The first things you should do as soon as you hit the ground are collect any weapons and ammo around you, and demolish anything you can for resources. You can always build your way out of any situation, as you can use stairs to scale hills and buildings, and walls to provide a barricade against incoming fire. Bare in mind that with a large staircase that someone has built, you can destroy the entire thing in one go by shooting the very bottom section, causing the rest of it to collapse. 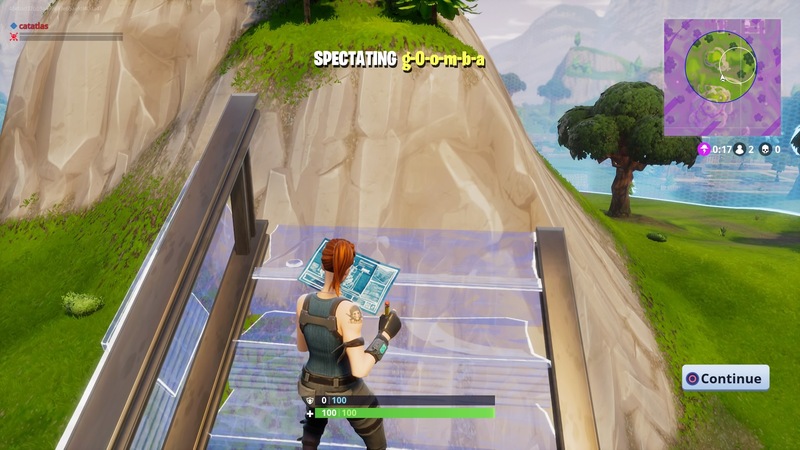 Keep in mind that there is fall damage, and if you shoot a staircase and cause a player to fall from a great height, you can instantly kill them. Always open treasure chests! They have a higher loot drop ratio than finding items scattered around the environment, so always make sure to crack them open if you stumble across them. If you see a blue flare on the ground, this indicates a loot box will be dropped their via air shortly. Plan around this, as you could claim the loot for yourself, or use it as bait to lure other players. The same goes for any loot that opposing players drop when killed. You could collect it for yourself, or you could leave it there and wait for other players to try and claim it. Always drink shield potions as soon as you have them. There's no point saving them for later, as you can free up a space in your inventory, as well as providing your with a nice boost to withstand powerful attacks from sniper rifles and other weapons. It's always worth tweaking your aiming sensitivity settings in Fortnite Battle Royale, particularly when weapon recoil is a key factor when firing automatic weapons. When you land with nothing but your pickaxe at the beginning of Fortnite Battle Royale, you're obviously going to want to get your hands on the best weapons, as quickly as possible. There are five total rarity types of gear in Fortnite, including gray (common), green (uncommon), blue (rare), purple (epic), and finally gold (legendary). For a full walkthrough of which weapons you should always be picking up over all others in the entire game, head straight over to our Fortnite Battle Royale best weapons guide. There's a vast number of cosmetic outfits available for your character in Fortnite Battle Royale. Although none of these outfits actually give you a gameplay advantage, there's a huge fashion side to Fortnite Battle Royale. For a complete ranking of the top 30 character outfits in the entire game, including all the latest skins available through the Seaosn 7 Battle Pass, head over to our best Fortnite skins page. 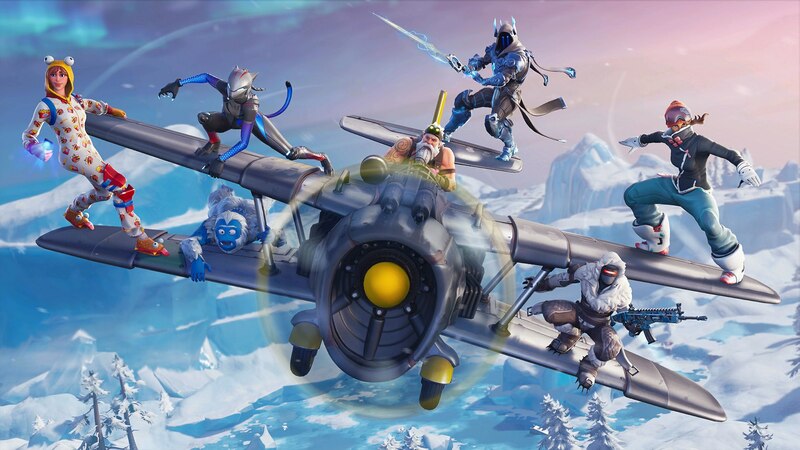 As part of the '14 Days of Fortnite' challenges, Epic introduced brand new challenges over the Holiday period. 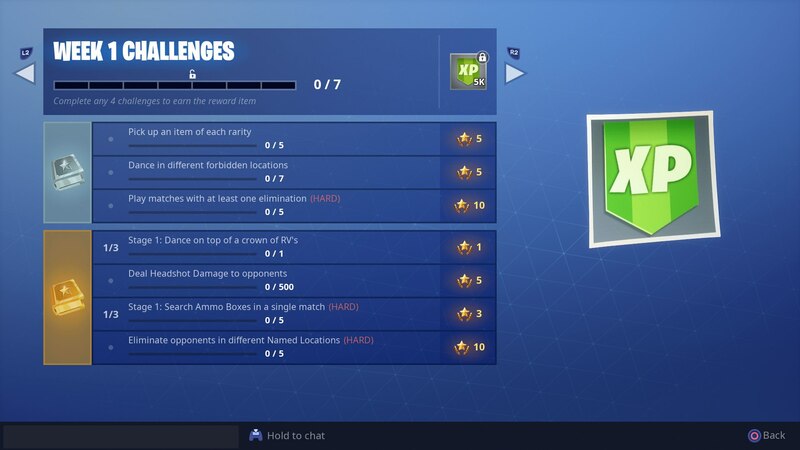 These challenges are temporarily gone from the game, but Epic has promised to add them back in later in January, so you'll have another chance to redo challenges that task you to find all the candy canes around the map. 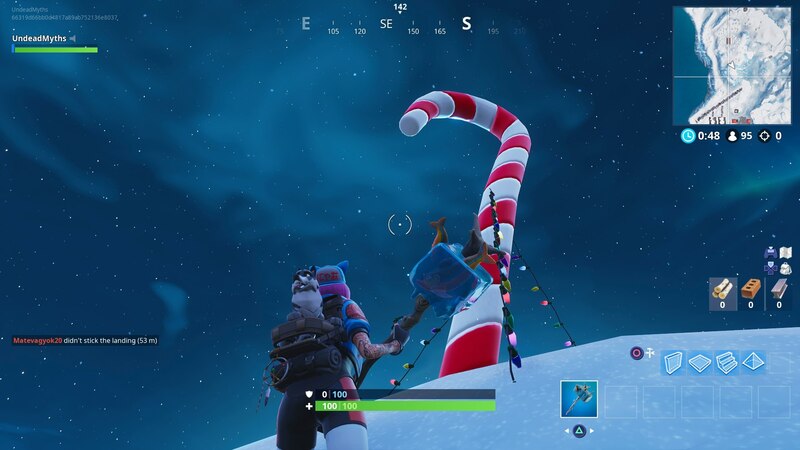 For a complete list of where you can find every single giant candy cane scattered around the Fortnite Battle Royale map, check out our Fortnite candy cane locations guide. Every single week in Fortnite Battle Royale, there are seven brand new challenges for you to complete, and they usually launch every Thursday. There are ten total weeks for every Battle Royale seasonal event, and all the weekly challenges are available to until the current season ends. Just below, you can find a complete list of all the weekly challenges that have launched as part of Fortnite Season 7 so far.